Patti over at Not Dead Style gives us the lowdown on up and coming fashion trends this season, it appears bomber jackets are making a comeback. 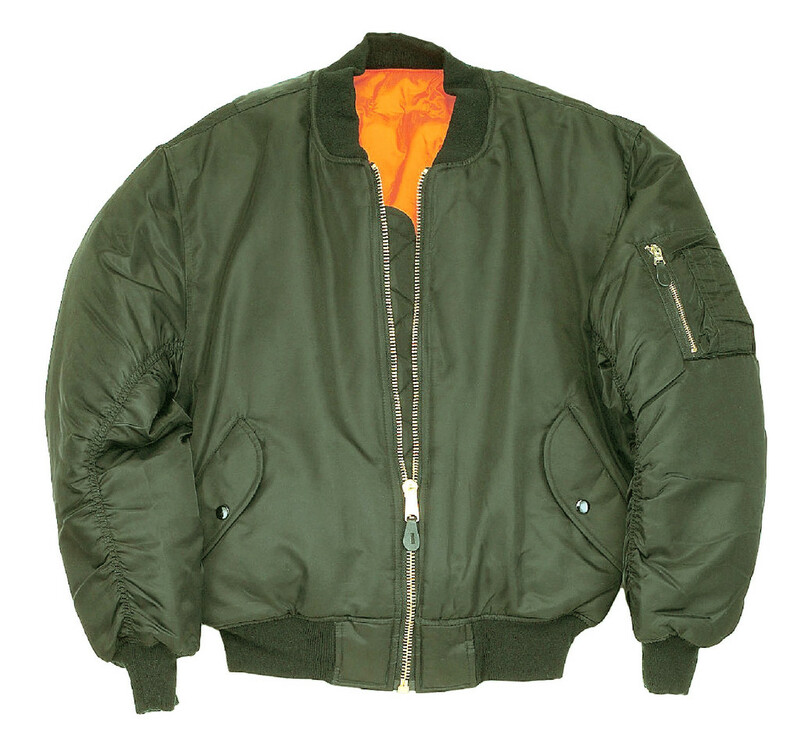 I can't help but recall those god awful dark green flight bomber jackets with florescent orange lining that were on trend in the 1980's, do you remember them too? Predominantly worn by men, but I do recall many a youth club night in the late 1980's when my female peers would also don a green bomber jacket to wear over the top of their dungarees and rugby shirts. Ugh! As much as I am sure military bomber jackets keep our bodies warm on cool nights, they are absolutely not the most flattering in colour or style. I wore my jacket yesterday, on the first sniff of cold weather we've experienced after an exceptionally hot and long Melbourne summer. All of a sudden perhaps bomber jackets aren't so awful anymore. 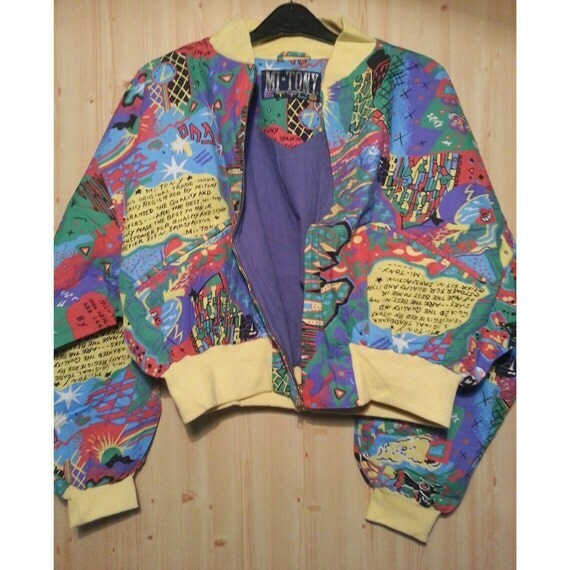 What do you think readers, should bomber jackets be left in the 80's or could it be a possible trend you'd revisit in 2013? Wow fashion flashback, I may not have been wearing that styling green and orange number back in the eighties, but I certainly remember an adult or two around me rocking them. I'm a bomber fan, of both the shiny floral print batwing sleeve versions and those being re-imagined today in leather, silk and tweed. Long live the bomber! Erica, your bomba jacket looks quirky, nothing like the horrible green ones the guys always wore. I had one too and it was neon green - can you imagine? Can't think of all the stares I would get if I wore it today! I had a blue bomber jacket which I wore to the footy. I also wore skinny black cords(I was thin then) that had zippers from the ankle to halfway up the calf. You would have to undo the ankle zipper to put them on. At least your bomber jacket is stylish and quirky. I still own an original 80s bomber jacket. I loved it then and I still love it now. It's a reversible jacket, with the main side being an all grey matte finish. The other side is a checked flannelette, which is very pilled. 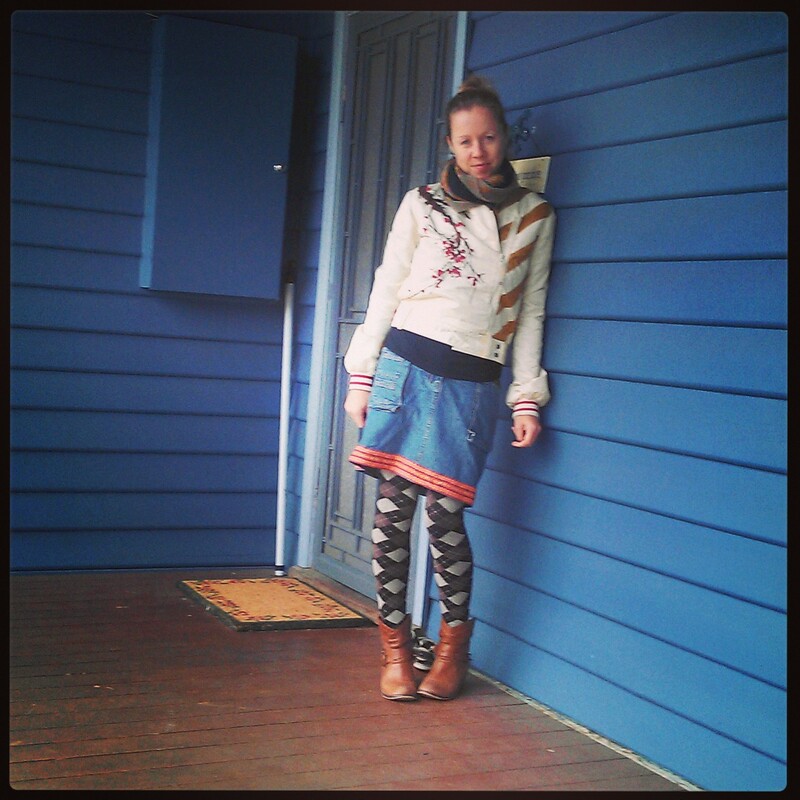 I rarely wore it with the checked flannelette side and definitely wouldn't now. The grey with a pair of well fitting denim jeans and boots is still a look I like and it is SO, SO warm. The look is all in the fabric!!! The green and fluoro orange jacket doesn't do it for me, but I love the suede leather one. The light colour of your jacket will make it very versatile... wear it with black, denim, browns... a great find!!! I actually own a few of them. I think with the updates they look great. Some even cute. I saw a pink one in a shop the other day. Would have bought it but pink is not my color. Oh dear, I remember when the giant puffer bomber jackets were in fashion when I was a teenager (what were we thinking?). I quite like the lighter versions you've pictured, though – particularly yours! Very nice. 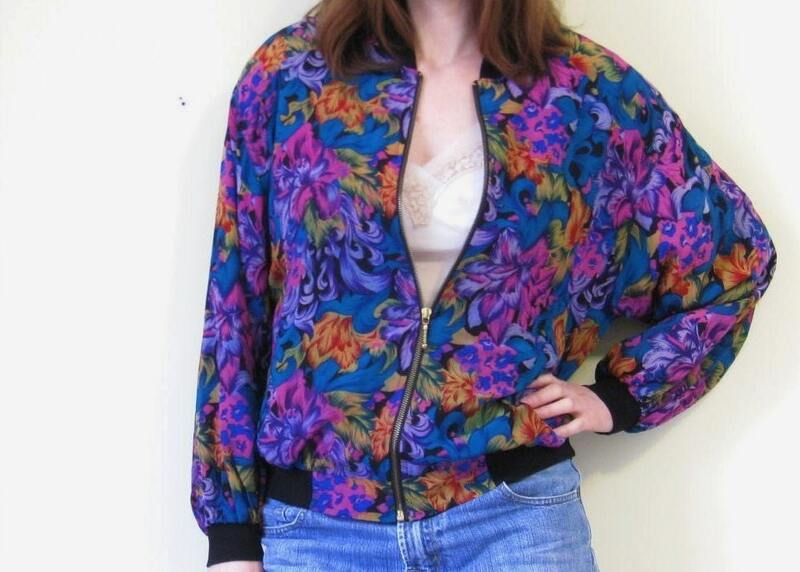 Well, your Edinburgh bomber jacket is not as full as they were in the 80's, if you compare it with the floral number. So, yes, to answer your question, let them make a - restyled - comeback, more in keeping with today's esthetics. And by the by, I drool over that bomber jacket of yours, it's absolutely fantastic! Oh, no...Pass the eye bleach! Nothing from the 80's was right, then, and now, a second wrong? That won't make it! Besides, those particular jackets were never meant for hips wider than 34". Trust me. But I adore what you've done with the lovely red blossoms! Well, I would wear it especially if I have a bomber jacket like yours or that tan one. You look lovely though and cozy. Ha! My boys (13 and 17) wear the green/orange ones! They're Dad and Grandpa's vintage (US). They Love them for camping, but decided they would be great for regular wear. No accounting for taste sometimes. I, however, do not partake.